At MacLarty Dental Lab, we take pride in all of our work and we don't take short cuts. 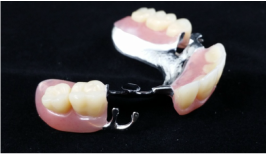 Our partial dentures are made with Lucitone 199, heat cured and injected for the best results. 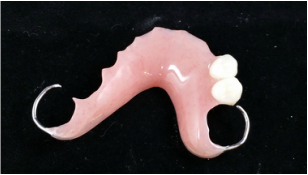 Flippers are one or two teeth acrylic partials. We do not take short cuts on our flippers. 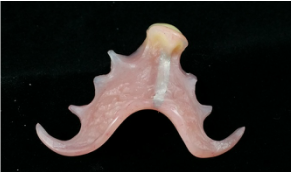 Notice we even use a reinforcement bar under a single tooth to keep things from breaking. 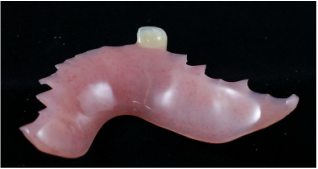 They are also heat cured and injected with 199. 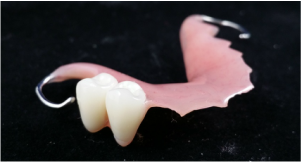 Our heat cured acrylic partials are also injected just like the flippers. The only real difference is the amount of teeth, three and up. 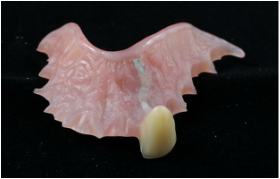 We also wax up and process partials with metal frames, but we do not cast our frames. We prefer our metal frames be made by a frame specialist. Once it is made and checked for a good fit, we will do the rest. Mike, the owner of Sorrento Smiles Dental Lab, is our frame specialist. He does a wonderful job for us. If you want to send your frames directly to him, you can reach him at 352-729-6295. He can send the frames to us if needed or directly to you for the frame try in. After that, we handle the rest for you. If you do not want to deal with another lab, we can also handle everything for you, just send the entire case to us.